(http://www.lionsboxingclub.com/) were delighted to host Richard Sylla's second visit to Montreal, the lively city where Canada's French and English cultures mingle. 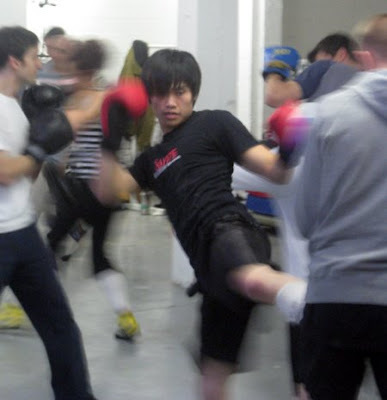 Local savate clubs in attendance included Concordia University's Wolverines and Savate World. Participants also journeyed from Connecticut and New Hampshire, USA, to train again with Sylla. Seminar participants were extremely enthusiastic about Sylla's teaching, finding him approachable and full of energy as well as extremely knowledgable. He set a physically challenging pace but also took the time to provide individual feedback to each participant, whether a beginner or an experienced competitor. Plans are progressing for a return visit this October. Saturday's informal gala evening delivered a meeting between a "Team Belgium," which included nine male athletes, and "Team North America." Belgian Chef D'Arbitrage Alexandre Walnier supervised and refereed the matches. The Americans and Canadians (joined by a single French guest, one of Richard's up-and-coming new competitors) put on a strong showing against much more experienced Belgians, producing two ties and one controversial stoppage despite the Belgians' general dominance. There was Gala on Saturday evening, May 30th. Canadians expected a delegation of athletes from Cameroon - international participation. OH YES...fast-paced bouts with controlled contact -- rules. 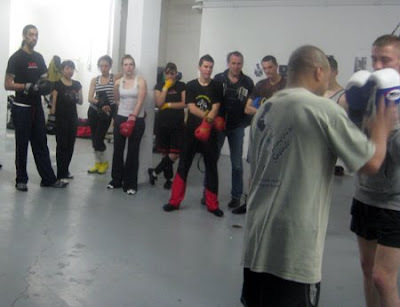 Thursday and Friday's workshops took place at Lion’s Boxing Club, 868-A Beaumont (entrance on side of building). Saturday's workshops took place at Ness Martial, 6995 Jarry Est. The cost was $50.00 per workshop before May 1st, with a 15% discount for those who register for all workshops. A group rate of $35.00 per workshop was available for groups of 10 or more.